Across the country, runners have been coming together to pay tribute to the city of Boston and all those affected by the bombing at the marathon one week ago. 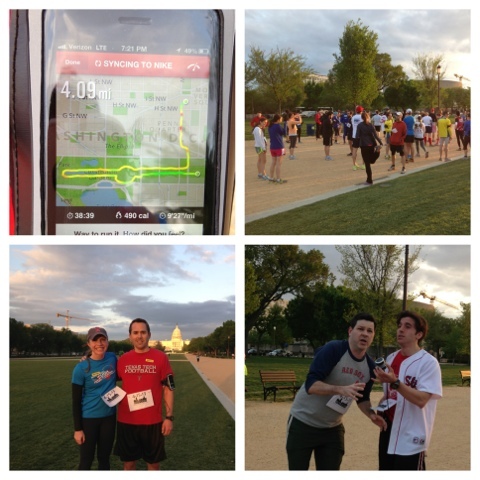 DC has had several runs in the past few days, and I participated in one last night. Not only do these tribute runs show that we are supporting our fellow Americans during this time of need, they also prove that terrorism and the fear terrorists try to provoke will not break our American spirit! Right after work my coworker and I changed into our running gear and hopped on the metro. The race started downtown and the second we got out of the metro stop we could hear music blaring. A crowd had already started to gather, and we quickly grabbed our bibs. After a moment of silence, we joined our corrals and we were off! Waiting in the metro, excited to run for Boston, got my bib, and the waiting crowd! Everyone was ready to run! The beginning of the race went through downtown DC and then the last three miles were along the National Mall passing the Lincoln Memorial, the Korean War Memorial, the World War II Memorial, and the Washington Monument. I teared up as we passed all of these landmarks. We are so lucky to live in a country where freedom is a guarantee and a true gift. 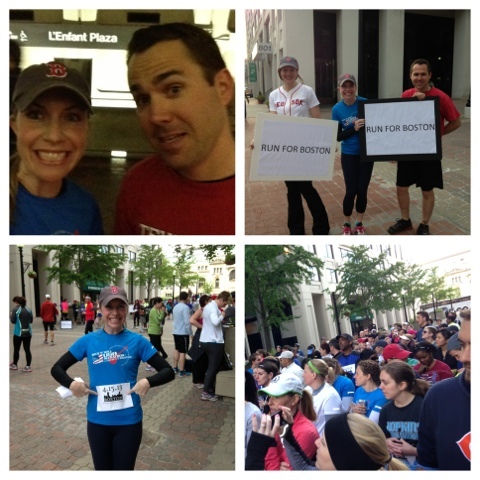 I am so thankful to those who have fought and are still fighting for our American rights, and I was so grateful to be a part of the Run for Boston. 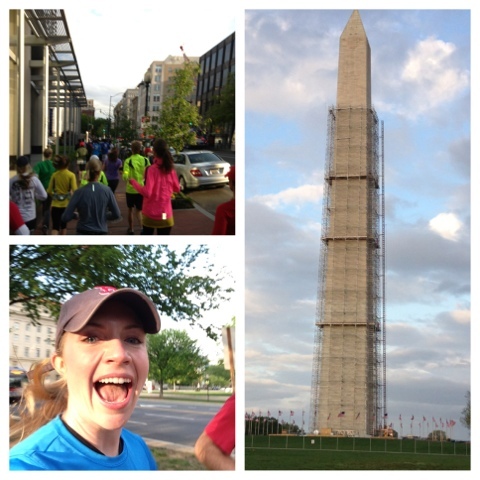 Running through Downtown, Close-up, and the Washington Monument. It is currently undergoing renovations after the earthquake a year and half ago. The race ended in front of the Capitol after 4.09 miles which matched the time the first bomb went off one week ago. As runners finished everyone was cheering and giving high fives. The morale and energy was sky high! 4.09 in Tribute, the crowd cheering as runners finished, Jonathan and me at the end, the song leaders. 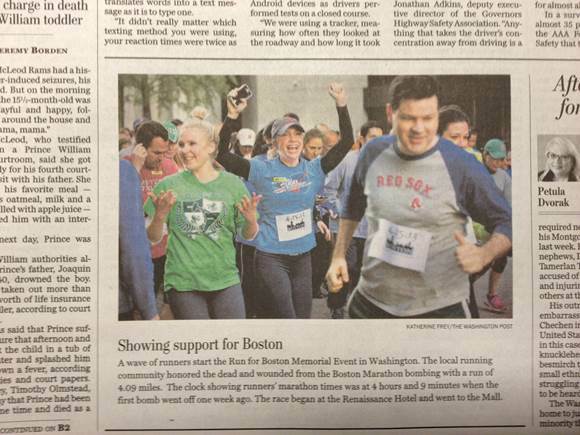 Like I said before, I am so thankful I was able to participate in this run not only to pay tribute to Boston but also as a reminder to myself. Each day is a blessing, and I want to live life to the fullest. I will keep praying for everyone in Boston and those who was hurt by the horrific occurrence on April 15th, but I will not live in fear. America/Americans will prevail, like we always do! Have you ran a tribute run? haha that picture is SO you! how fun. haha that's so awesome that you were in the paper! !